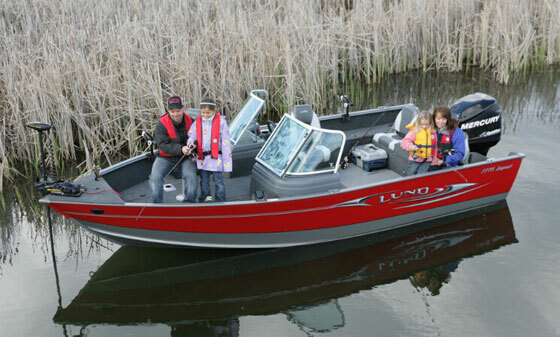 Packed with standard features and priced right, this Xpress is aimed at the year-round sportsman on a budget. 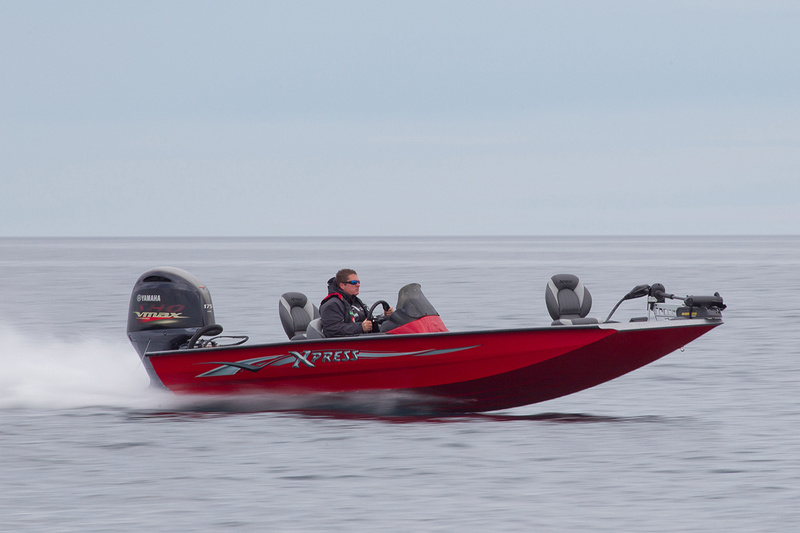 Xpress calls its new XP180SS model a “cross-over” boat intended for an owner who might use it year-round for fishing and hunting, in fresh or salt water. In years past, this all-around sportsman might have owned two or three boats, each designed for a specific task. But in this economy, one boat may be all that a tight budget can handle. And with that also in mind, Xpress gives the XP180SS an attractive list price of $15,999, including a Yamaha F70 outboard, a trailer, and quite a few extras. For fishing, hunting, or just prowling around the lake, the Xpress XP180SS offers versatility and great performance when paired with a Yamaha F70 outboard. On the scene since 1966, Arkansas-based Xpress has a well-earned reputation for turning out rugged, all-welded aluminum jon boats. 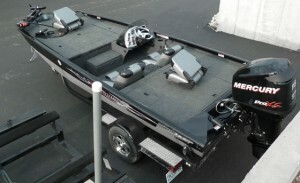 In the 1980s it was one of the first aluminum builders to develop a pad-style running surface to boost the performance of its bass-style, modified-V hulled boats. The XP180SS features that Hydro-Dynamic hull shape, though the pad area is less pronounced than might be found on some larger Xpress models that will run at higher speeds with more power. 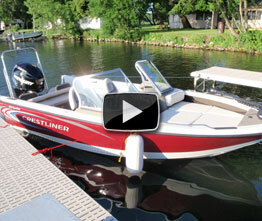 This 18-foot mod-V model is rated for up to 90 hp, but I thought it ran great with the spunky Yamaha 70 on the transom. Top speed in my lightly-loaded test trim was about 36 mph. The XP180SS planed off instantly with no bow lift, and delivered acceleration that was really fun. I think you could load this boat up with dogs, gear, and buddies and still find the performance to be acceptable with the 70-hp offered in this package. The handling was also very precise, with no sliding or skidding in high-speed turns. Xpress has clearly developed this hull shape well. The deck layout combines fishing platforms and room for bulky cargo. This Xpress model has a one-piece hull that’s stamped from a single sheet of 0.1-gauge aluminum, with a welded seam to form the bow. The floor is then welded in place over longitudinal inner ribs, and the resulting cavity is filled with flotation foam. Then the decks and storage boxes are welded in place over the floor. Xpress offers this same hull as a stripped-down utility boat, with just a bench seat and a bare console, but the XP180SS incorporates a number of features from various option packages in a boat that makes a decent compromise between utility and amenities. 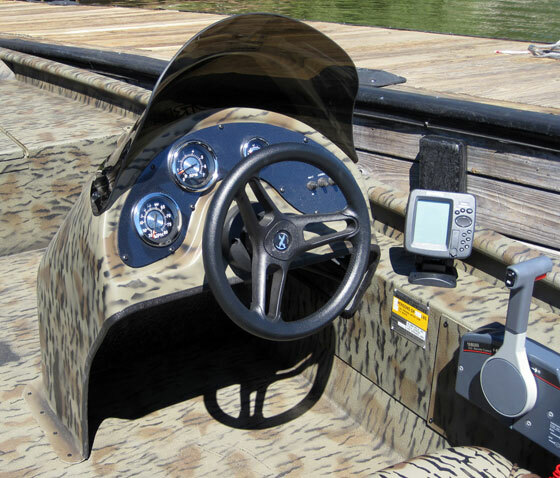 Start with the finish, which features a camouflage paint scheme on the hull and a matching pattern in the interior executed with Xtreme Coat Liner, a coating that’s similar to spray-on pickup truck bed liner. Xpress first sprayed Xtreme Coat on boats headed for salt-water use, and it offers a number of benefits over standard paint, the most obvious being durability. This plastic coating will not wear away under sandy boots and sliding coolers, and Xtreme says it also will not fade. Just hose it out and the boat looks like new. It also stays cool to the touch in the sun even in darker colors, adds some traction under foot, reduces glare, and deadens sound to some extent. The hatch offers great access to fuel tank fittings and battery, but there’s no other storage space below the aft deck. The slot acts as a splashwell to catch backwash, which is minimal. To further adapt the XP180SS for use in brackish bays, Xpress equipped the boat with stainless steel deck hardware, and the Back Track trailer included in the package has a welded-aluminum frame. One interesting design point is at the transom, which is only a few inches higher than the deck and does not have a formal splashwell. Instead, there’s a slot forward of the transom that’s open to the bilge, allowing any backwash to slurp below the deck and right to the bilge pump. I expected that this would happen frequently, as the freeboard is pretty low, but the Xpress rep on hand told me that the angle and shape of the transom was designed to prevent backwash in normal situations. So of course I gave that a test when I drove the boat, chopping the throttle at speed—and he was right, the water never came close to coming over the transom. (This might change with a heavier load, of course.) 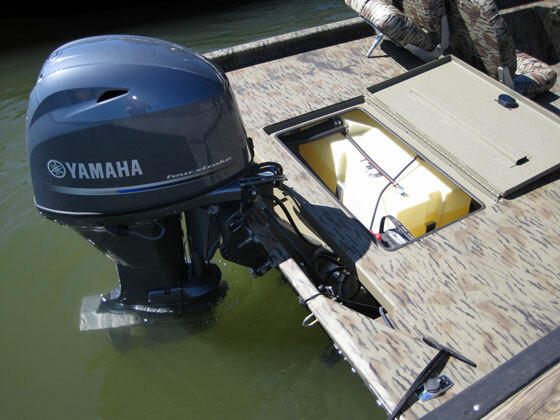 That opening to the bilge also provides excellent ventilation for the easily accessed 18-gallon plastic fuel tank and the battery, and should help the bilge dry out quickly. A molded fiberglass console holds instruments and a tall wind deflector. The Humminbird graph unit is part of the XP1800SS package. The aft deck is large enough to fish from, and has a socket for one of the two pedestal seats that come with the boat (also finished in camo), but the single hatch back here services only the battery and fuel tank area; there’s no real storage room available aft. 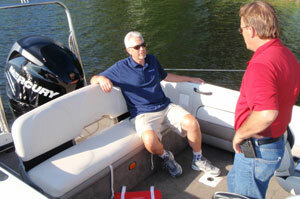 Because the hatch on the boat we tested did not have a latch, it rattled a little when the boat was underway. Moving forward, there’s a rod box to port that will handle seven-foot sticks. It’s lined with carpet, which cushions gear but won’t dry quickly. There’s more dry storage below the seat base, which flips up with the two bucket seats in place. 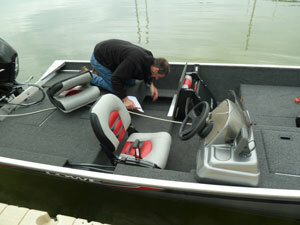 The forward deck has another pedestal seat socket, and an aerated 22-gallon livewell at its aft edge. This package also includes a MinnKota 45 bow-mount trolling motor and a Humminbird PiranhaMax 160 fish locator, which is mounted near the helm. The helm console is about the only part of this boat that’s not aluminum. It’s molded fiberglass and is topped with a decent wind deflector and holds a speedometer, tach, and fuel gauge. I found the molded-plastic wheel to be a little low and far from the seat, but this does make it easy to get up when you need to. Xpress has hit a nice sweet spot with deck versus cockpit space on this model. 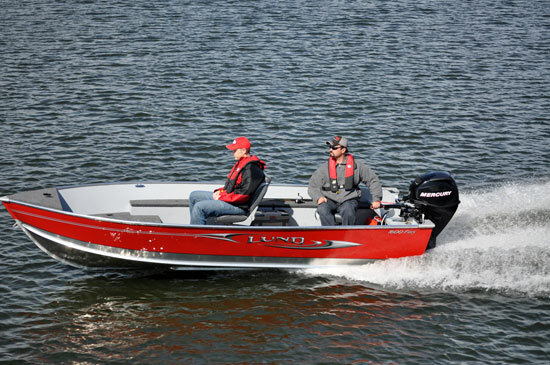 Both fishing platforms are big enough to be comfortable, but there’s still quite a bit of room forward the helm console for coolers, decoys, dogs, or friends. And that’s sort of the plan with this boat: It might not be the best fishing layout, or the best hunting/utility design, but if you don’t mind a little compromise, this is one boat that will keep you on the water through four seasons. 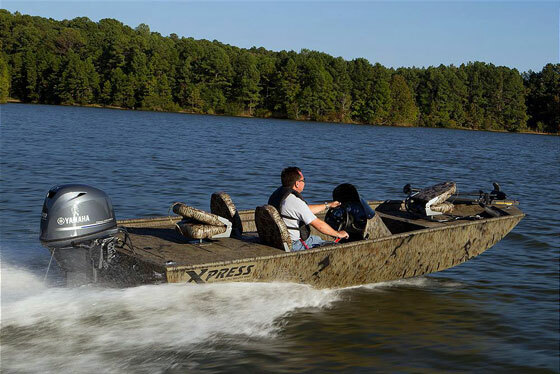 Xpress offers similar SS models in 16-, 17- and 20-foot lengths, packaged with an appropriate-size Yamaha outboard, priced from $12,995 to $19,995. For more information visit Xpress Boats.